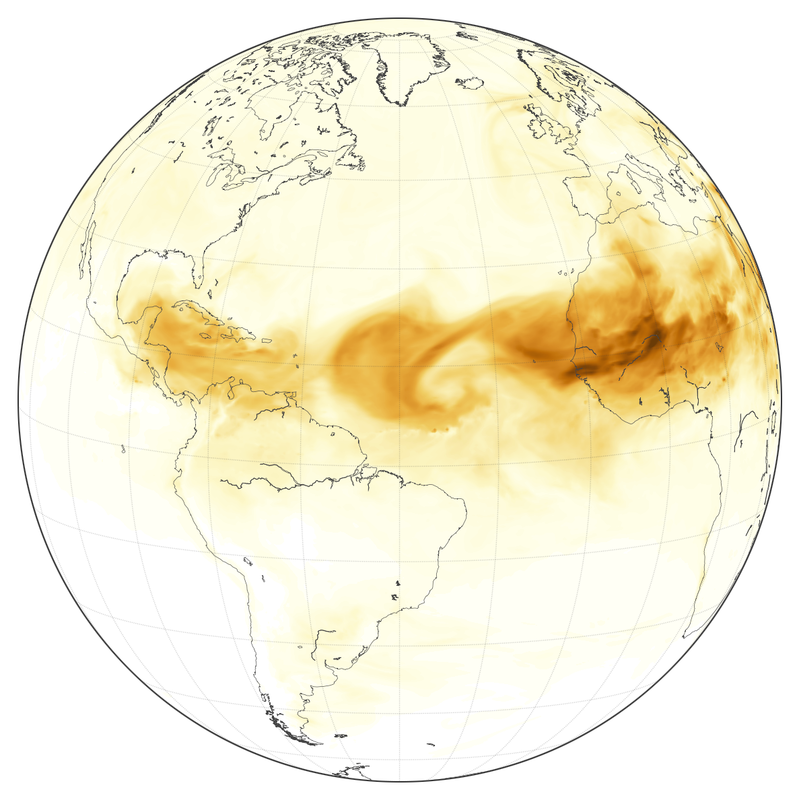 The Sahara Desert, the Caribbean, and Texas may be several thousand miles apart, but a massive cloud of dust connected these places in late June 2018. 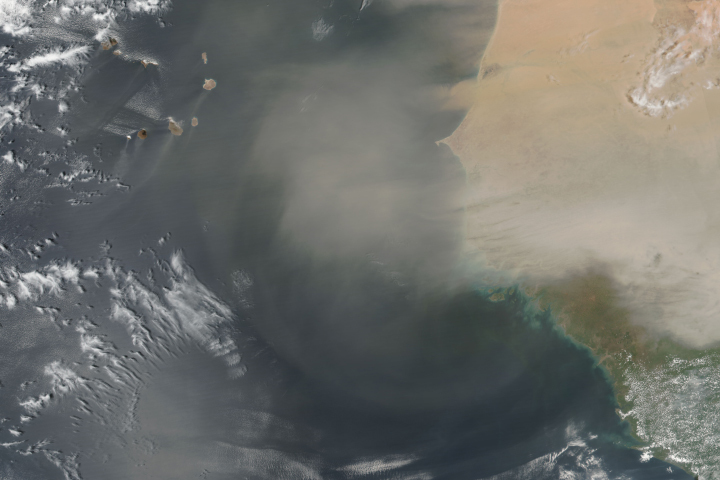 On June 18, satellites began to detect thick plumes of Saharan dust passing over Mauritania, Senegal, Gambia, and Guinea-Bissau before moving out over the Atlantic Ocean. For the next ten days, the skies over West Africa and across the tropical Atlantic were stained a distinctive shade of yellow as winds pushed pulse after pulse of Saharan dust to the west. According to one preliminary analysis, this brought the tropical Atlantic one of its dustiest weeks in 15 years. 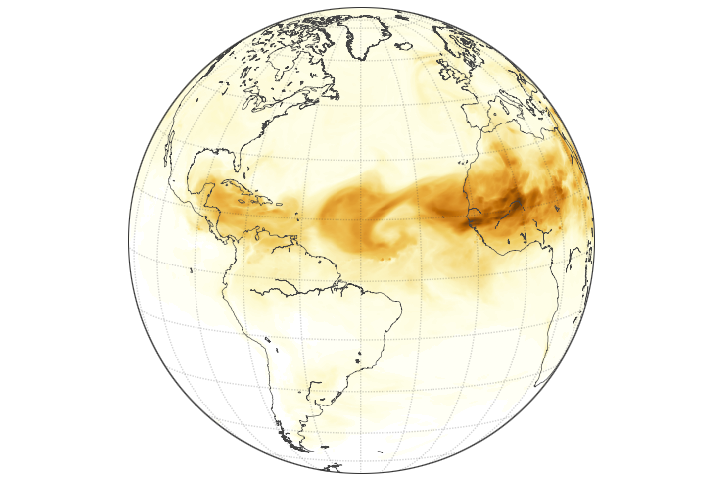 The map above shows dust crossing the Atlantic on June 28, 2018, as represented by the Goddard Earth Observing System Model, Version 5 (GEOS-5). A simulation from GEOS-5 shows plumes of dust from as far away as Iraq and Saudi Arabia blowing across North Africa in mid-June. 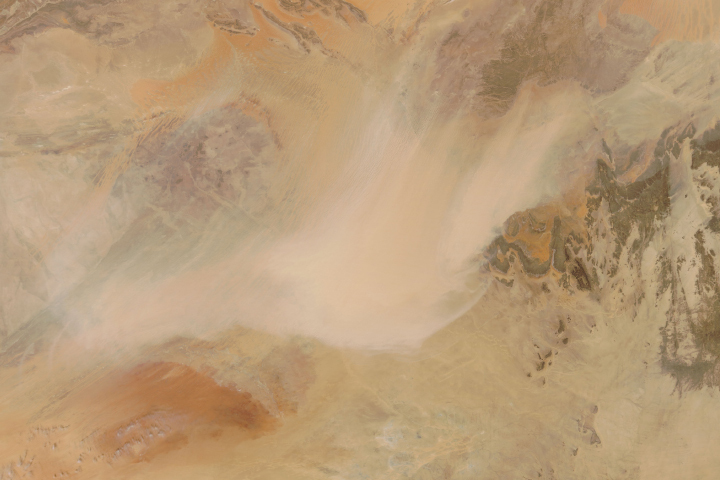 However, much of the dust that crossed the Atlantic Ocean appeared to be coming from the Bodele depression, a dried lake bed in northeastern Chad. GEOS-5 is a global atmospheric model that uses mathematical equations to represent physical processes. Measurements of physical properties like temperature, moisture, and wind speeds and directions are routinely folded into the model to keep the simulation close to observed reality as possible. The millions of calculations involved in such a detailed model require thousands of computer processors. 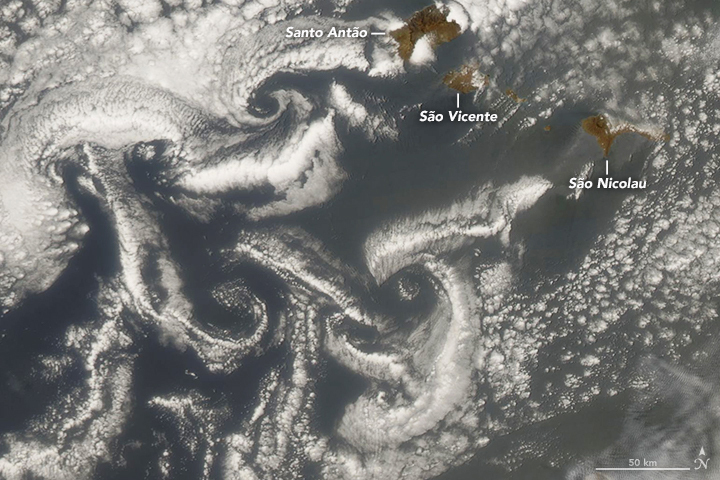 Several satellites have captured images of the dust crossing the Atlantic. NOAA shared a striking image from GOES-EAST on June 27, 2018. 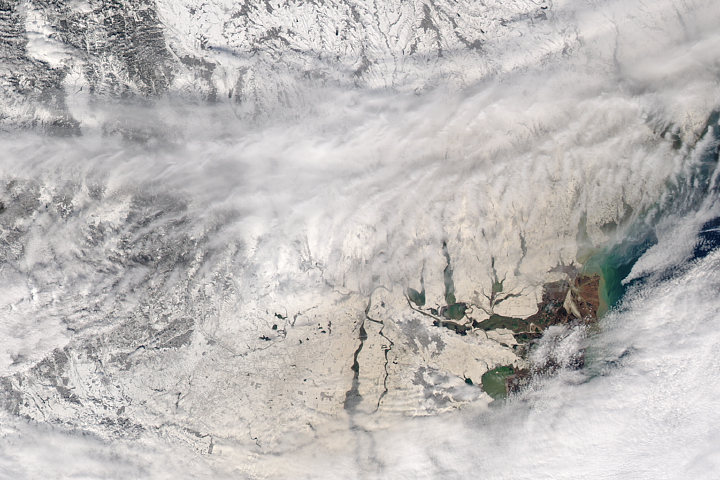 The Moderate Resolution Imaging Spectroradiometer (MODIS) sensors on the Terra and Aqua satellites also imaged the dust several times. 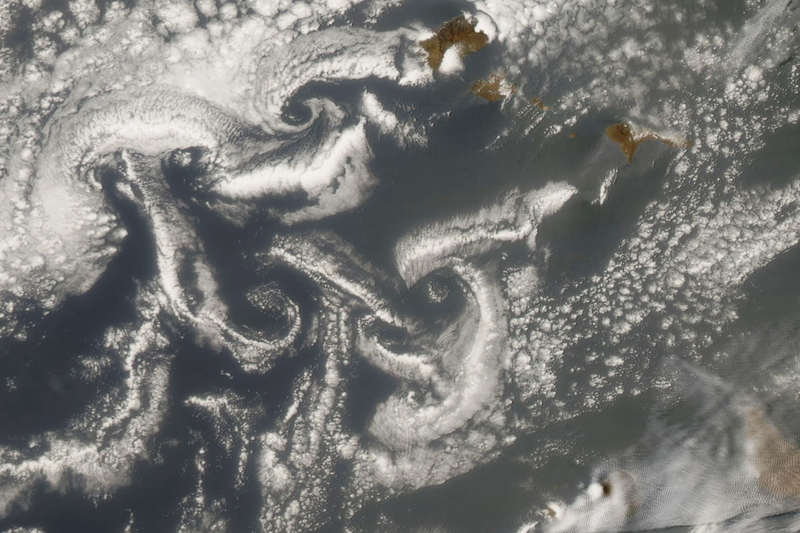 On June 24, 2018, the MODIS on Aqua acquired the image below, which shows clouds swirling into an eye-catching pattern as winds flowed around the Cape Verde islands. The entire scene is hazy because of the dust. Normally, hundreds of millions of tons of dust are picked up from the deserts of Africa and blown across the Atlantic Ocean each year. 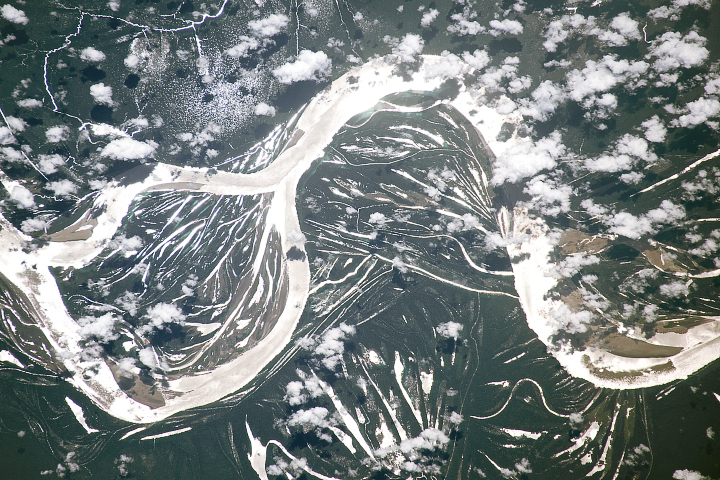 That dust helps build beaches in the Caribbean and fertilizes soils in the Amazon. It affects air quality in North and South America. It likely plays a role in the suppression of hurricanes and the decline of coral reefs as well. Austin American-Statesman (2018, June 28) Hazy skies expected in Austin this weekend as African dust cloud looms. Accessed June 29, 2018. 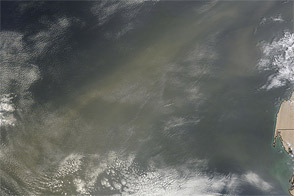 NASA EarthData (2007) Saharan dust versus Atlantic hurricanes. 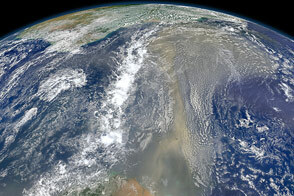 NASA Earth Observatory (2013) Tracking Dust Across the Atlantic. The Weather Channel (2018, June 27) Saharan Dust Spreading Hazy Skies Across Caribbean and May Reach Texas By This Weekend. Accessed June 29, 2018. The Yucatan Times (2018, June 27) Dust from Sahara desert crossed the Atlantic all the way to the Yucatan peninsula. Accessed June 29, 2018. U.S. Geological Survey (2013) The Effects of African Dust on Coral Reefs and Human Health. Accessed June 29, 2018. NASA Earth Observatory images by Joshua Stevens and Lauren Dauphin, using GEOS-5 data from the Global Modeling and Assimilation Office at NASA GSFC, and MODIS data from LANCE/EOSDIS Rapid Response. Story by Adam Voiland. 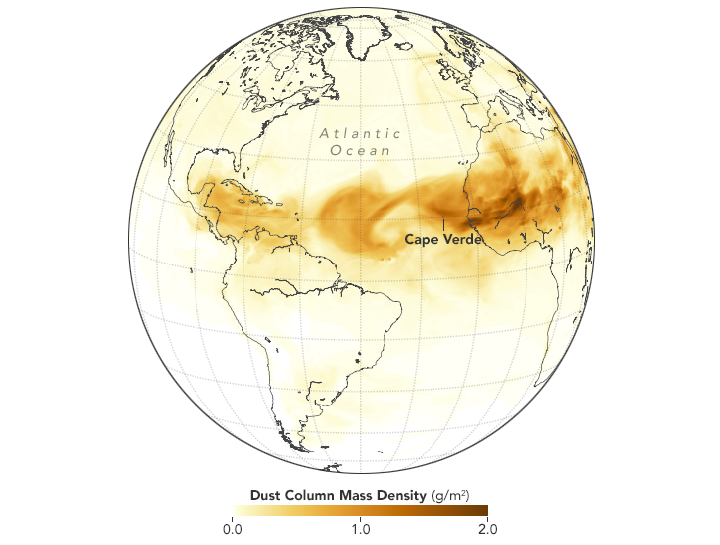 The dust in the skies over the Caribbean and Southern United States has distant origins. 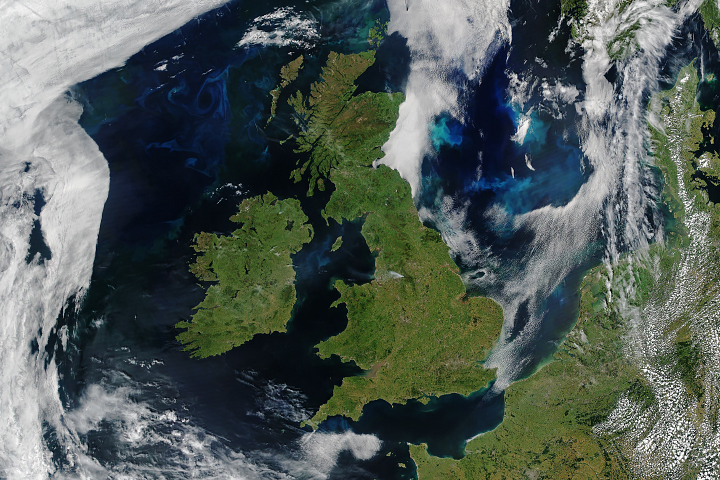 In March 2018, strong winds carried massive plumes of desert dust into Europe and Central Asia, as well as over the Atlantic Ocean.